Fine tsavorite garnets are rare in any size, but they are considered especially rare in sizes over 2 carats. 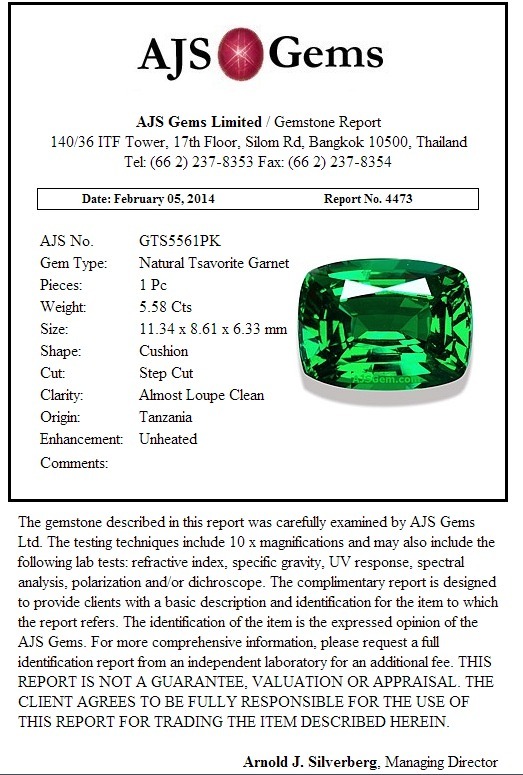 Any tsavorite over 4 carats falls in the ultra-rare category. The 5.58 ct tsavorite from Tanzania shown above certainly qualifies. 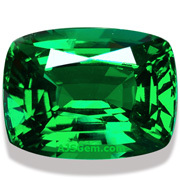 But this tsavorite is not only very large, it is a very fine color with excellent clarity. The color is a rich but bright chrome green that rivals the finest emerald. Fashioned in an elegant cushion, this gem display full brilliance and fire. This is also a very clean stone and we've graded this gem "almost loupe clean." View our video below of this outstanding gem. This tsavorite is completely natural and untreated and was one of the finest specimens in our collection. It was sold to a private collector in July, 2013.